Anxiety and depression are the most commonly occurring mental health conditions in the UK with over 7% of the population meeting the criteria for diagnosis. Those who are suffering with anxiety often find panic attacks one of the hardest symptoms to overcome and learn to deal with. But what is a panic attack and why do they occur? 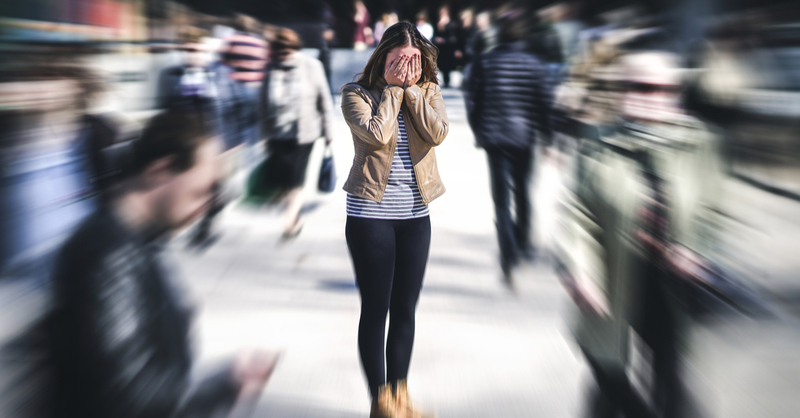 Many people who experience panic attacks report feeling detached to the situation, their body and their surroundings and are commonly confused with a heart attack due to the combination of symptoms. Those who experience one panic or anxiety attack are more likely to experience a second, with many people developing further anxiety about having another attack, due to the unpleasant symptoms. Experiencing anxiety or panic attacks – whether they happen when you’re alone and there is no one to assist you, or in public where everyone can see and might not understand your mental health condition – can be an extremely scary and uncomfortable experience. Attacks usually last between five and 20 minutes, whilst the frequency of attacks vary from person to person – from a couple of times a month to several times per week. Cognitive Behavioural therapy (CBT) – the most effective form of therapy for those suffering with anxiety and panic disorders. Acceptance and commitment therapy (ACT) – the more effective form of therapy for those suffering with depression and anxiety disorders. Many people feel like they’re experiencing a heart attack when the symptoms of a panic attack first occur – and once people believe they’re having a heart attack this often causes anxiety levels to rise and panic attacks to worsen, creating a vicious cycle. Recognising you are in fact having an anxiety attack, and not a heart attack can help you to calm down a lot quicker and prevent your panic attack from worsening. Breathing exercises are a great way to take back control when an attack starts. Those experiencing panic attacks often find the first symptom they experience is shortness of breath or a struggle to breathe – keeping on top of your breathing helps you to keep calm rather than panic further due to the physical symptoms of the attack. Different types of breathing work for different people, for example three breaths in (through your mouth) whilst clenching your fists, followed by four breaths out (through your nose) whilst unclenching them is helpful for some people, whilst others suggest slow, deep breaths from the diaphragm (four seconds in, pause for one second and four seconds out) can help you to quickly relax. Once you have taken control of your breathing, taking a gentle stroll is a great way to release endorphins and help lower your levels of stress and overall improve your mood. Engaging in light exercise a few times per week has been proven to lower levels of anxiety and improve the symptoms of depression – joining the gym, signing up for a local dancing class or even engaging in yoga in the comfort of your living could be a great way to improving your overall mental health, and therefore lowering the risk of further panic attacks in the future. Blocking out your surroundings is a quick way of preventing a fast-paced environment from further triggering your panic attack. If you’re in a public space where everything is happening at a rapid pace, closing your eyes can give you the respite and peace you need to calm down for a few minutes. Many people who suffer panic attacks suggest picturing their “happy place” when attacks occur – think of your favourite beach, woodlands or mountain lake to try and take your mind as far away from the panic attack as possible. Ensure you’re picturing a place that is peaceful and relaxing, and try to imagine yourself there as you focus on your breathing. Visit our website to learn more about how online therapy and our fully qualified, professional psychologists and psychiatrists could help you to overcome your panic attacks or anxiety disorder. Online therapy allows you to enjoy all the benefits of professional therapy from the comfort of your home or office without disrupting your busy schedule and our online platform has been expertly designed to deliver therapy in a convenient and accessible way – sign up today to learn more about how it could help you.